Sitting on a leather sofa as shown. One hand holding a martini. One hand holding the one end of a pair of shades. Background of a shoe closet as shown. The way she sits should face a bag closet, and must show the red shoes of her heels, . The client has everything in mind. My job is to put everything she wanted on paper, artistically and aesthetically. I am immuned to the fashion, especially the ladies. Now, she provided me all the photos. Saved me the trouble and cracking my head. But my stress was drawing them as close to the photos as possible. The result was satisfactory. 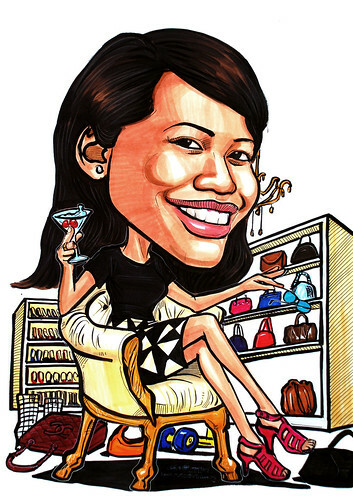 This caricature looked 'rich' to me.